A system that permits Disaster Recovery Workers to quickly and efficiently move flammable liquids before, during, and after a natural or manmade disaster. The DRPP permits disaster assistance and recovery vehicles to be quickly and safely fueled in disaster stricken areas where the electric power system has failed. Immediately after a disaster fuel for emergency vehicles may not be available to Disaster Recovery Workers. Fuel may be present in underground storage tanks at retail service stations and other locations but cannot be recovered either because the station has been destroyed or has no available electrical power. Simply bringing in a generator and connecting it to the fuel pumps is not the answer as many modern fuel storage systems use submerged pumps powered by one circuit and controlled by fuel dispensers that are powered by a separate system. These systems are tied in to tank and piping leak detectors that will not permit the pump to start if system integrity cannot be electronically confirmed or if the tank monitor is electronically off-line. Pre-Pay and Post-Pay functions at modern stations are controlled by a console inside the station. This console must also be powered to bring the dispensers on-line to start the pumps. Some consoles will not power-up without being able to communicate with their remote controllers in another state. Some emergency vehicles burn diesel and others burn gasoline. Both types of pumps would need to be hardwired to the generator. The submerged pumps in a station cannot be used without the separate fuel dispensers. – Portable and able to be loaded and transported in a pickup truck bed, the side door of most helicopters, light cargo aircraft, small trailers, and military and disaster vehicles. – Aluminum construction for lightweight and easy handling. – Does not require electricity to operate. – The DRPP is complete in one unit with no bulky accessories or additional tools required. All tools necessary to open most underground storage tanks are in the DRPP toolbox. – The DRPP System is heavy duty and rugged for field use. – The system is capable of being stored for extended periods without costly maintenance or preservative functions. – A stock of “Consumables” including filters and forms is included with each DRPP and are stored on the DRPP itself in a storage compartment. – Complete operating instructions for all fuel types and fuel system types are included with pictures and simple to understand drawings and illustrations. The instructions are laminated for use in adverse conditions. – The DRPP is equipped with an electrical bonding and grounding system to ensure against static discharge fires during fueling operations and to comply with fire regulations. – Permits the fueling of emergency and recovery vehicles directly from the underground or above ground fuel storage tank or the movement of that fuel to other storage. – The DRPP removes water and contamination from the fuel being moved. 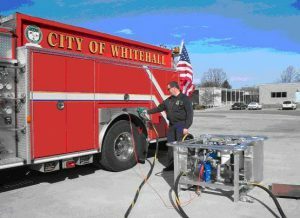 – Can refill fire department water tanker trucks from unpressurized water sources such as ponds, streams or swimming pools. – The DRPP can take fuel directly from the fuel tanks of immobilized or destroyed vehicles to fuel active vehicles or render immobilized vehicles safe for transport or towing. – The DRPP can remove fuel from tanks before flood waters reach them and put the fuel in virtually any kind of tank. – Use of the DRPP does not immobilize the tanks being pumped from and does not disrupt the electrical connections or plumbing to those tanks. As soon as the power comes back on the station can resume normal operation without the need to repair or rewire anything. – A hurricane has destroyed houses, roadways, building, the electrical distribution grid, and the telephone system for a wide area of southern Florida. Emergency vehicles have survived but all power is gone with the exception of localized emergency generators. Roads are blocked and the widespread devastation precludes rapid restoration of services. – Police, fire, rescue and recovery vehicles are present but have only the fuel in their on-board tanks to operate with. Cranes, bulldozers, and construction equipment are present but suffer the same problem with fuel. Emergency generators have their own fuel tanks but their run time is limited to the fuel available in those tanks. – Fuel is available in underground and above ground fuel storage tanks at retail service stations, governmental filling stations, and marinas but cannot be accessed because of the power disruption. – Vehicles, including four-wheel drive pickups, utility vehicles, and emergency service vehicles are dispatched to known sources of fuel including retail service stations and terminals. – On arrival the DRPP is removed from the vehicle and set up. The proper fuel storage tank is selected based on the markings inside the tank fill sump. – An angled chain wrench is taken from the DRPP toolbox and used to remove the locked fill cap and adapter from the underground tank fill pipe. The entire mechanism, including the padlock, is removed with a few turns of the wrench. – The drop tube, if equipped with a float valve, is removed by hand (it just slips into the fill pipe), and the suction hose from the DRPP is dropped into the 4″ tank opening thus revealed. DRPP instructions and changes valve positions to “GASOLINE/AVGAS” or “DIESEL/JET” as appropriate. it through a 1-micron water-absorbing filter designed for the selected fuel, past a mechanical meter, and into the discharge hose. The operator then uses a standard fueling nozzle to fill the vehicle fuel tank. He fills other vehicles as they line up for fuel or puts the fuel into the storage tank on the truck. seconds into the previous tank to purge the system of the previous fuel. The new fuel is run through the filter appropriate to that fuel by simply changing valve positions again. – After fueling is complete the operator takes a form from the DRPP tool box, records the total gallonage and fuel type taken, and places the form in the supplied weatherproof envelope and posts it in a conspicuous place to enable the fuel tank owner to know how much fuel was taken and to permit him to bill for the fuel after normal operations resume. – When all fueling is done, the operator can restore the station to its previous condition by simply reinserting the drop tube into the fill pipe and screwing the fill cap assembly back in place. Advantages: Vehicles are fueled quickly and safely from local fuel sources. Fuel need not be flown in, generators and personnel need not be diverted to getting gas stations running, immediate disaster recovery operations are not delayed by lack of fuel. – Helicopters from outside a widespread disaster area are being used to ferry personnel and recovery equipment into the area. Due to the distance to be traveled the helicopters are limited in their lifting capacity in order to have sufficient fuel to return. If they can fuel in the disaster area they can carry more people and supplies. – JET-A fuel is available from the underground tanks located at the regional airport that has been heavily damaged in the disaster. – A helicopter moves a DRPP to the airport and sets it on the airport fueling ramp near the underground tank farm. – An angled chain wrench is taken from the DRPP toolbox and used to remove the locked fill cap and adapter from the underground tank fill pipe. The entire mechanism, including the padlock, is removed with a few turn of the wrench. As a second option, depending on the configuration of the tank farm, the DRPP can be connected directly to the underground tank “thief pump” suction pipe or to the “Fueler Fill Connection” on the JET-A fueling system. Complete instructions are provided with the DRPP. – The suction hose from the DRPP is dropped into the 4″ tank opening thus revealed, or, is directly connected to the appropriate fittings. – The DRPP operator deploys the discharge hose from the DRPP to a five gallon bucket and pumps five gallons of fuel to ensure that the hoses and pump are properly purged of other fuel types. He then connects the hose to the helicopter to be fueled or to a mobile storage bladder brought in by air. He checks the DRPP instructions and ensures that the valves are set to “DIESEL/JET” and that the diesel filter has been replaced with a JET-A filter. A JET-A filter will be provided with the DRPP. – He uses the recoil starter to start the lightweight diesel driven pump on the DRPP. The pump self-primes and pulls fuel from the underground tank, passes it through the JET-A 1 micron water-absorbing filter, past a mechanical meter, and into the discharge hose. The operator then uses an overwing fueling nozzle to fill the helicopter fuel tank. – The Differential Pressure Gauge and Millipore Sampling Connections that are standard on the DRPP meet FAA and ATA fueling requirements for JET-A. Filter drains, as required for JET-A, are installed on the DRPP. – After fueling is complete, the operator takes a form from the DRPP tool box, records the total gallonage of JET-A, and places the form in the supplied weatherproof envelope and posts it in a conspicuous place to enable the fuel tank owner to know how much fuel was taken and to permit him to bill for the fuel after normal operations resume. – When all fueling is done, the operator can restore the fuel farm to its previous condition by simply reinserting the drop tube into the fill pipe and screwing the fill cap assembly back in place or reattaching the thief pump as appropriate. Advantages: Helicopters serving the disaster operation can now make more frequent flights while carrying heavier loads thus reducing the number of aircraft required and reducing the cost of the operation. Disaster recovery operations proceed more quickly and efficiently. – Rising floodwaters from the Mississippi threaten a small town. The decision is made to abandon the town and evacuate. There are three gasoline stations in the town with underground tanks, a fuel distributor with above ground tanks and the Town’s Municipal Garage with two above ground tanks. Tanker trailers are available to move the fuel away from the soon-to-be inundated town but floodwaters have already destroyed the power grid serving the town and power is not available. – Fuel from the underground tanks will be discharged into the river if the tanks stay in the ground. The environment will be damaged and, when buildings are downstream from the tanks, the escaping fuel can enter the buildings and result in serious fires. If the tanks bob out of the ground, a common occurrence in extended inundations, the partially full tanks will float down the river and present a fuel-laden downstream hazard. The above ground tanks will float with the flood discharging their fuel into the environment. – A number of DRPP’s are deployed to the town along with the tanker trailers needed to move the fuel. – The underground tanks are opened using the instructions and tools on the DRPP, the discharge hose is connected to the tanker trailer fill connection or, if not compatible, just dropped into the tanker’s roof hatch. tank and fills the tanker. – When all fueling is done, the operator leaves the fill valves open to permit floodwater to enter the underground tanks. This will prevent them from bobbing out of the ground during the flood. The water can later be pumped out and the tanks cleaned and returned to service. Leaving drain fittings, located at the tank bottom, open, and removing the emergency vent top fitting on the above ground tanks will permit them to fill from the flood and they may remain in-place rather than floating. Advantages: Environmental damage from escaping fuel is prevented, a fuel source for downstream fires is removed, and economic damage to the service station owners is mitigated.